Paw Talk - Pet Forums > Other Pets > Aquatic Discussion > Some advice to a new betta owner? Some advice to a new betta owner? Hello, my name is Ella and I own two very beautiful male beta fish. (in separate bowls, of course) Unfortunately, I don't exactly have a lot of money, or a lot of space for two, nice big tanks. I have a gallon fish bowl for each of my beta, with no filtration system that I clean out once a week, or even sooner if I have time- I usually do the later. My older beta, Bently, who I have had for four months, is healthy and lively. But my other fish, Sheldon, is younger (had him for a week) and he isn't eating his food. I tried giving him freeze-dried bloodworms and pellets, but he won't eat either and stays at the bottom of his bowl, moping. I don't understand, because Bently manages his gallon bowl just fine. I got both of them at Petsmart, and that is where I shop for them. Any advice for some inexpensive things to help brighten up both of my beta? First of all there is a lot of info circulating on the proper housing for bettas (it's 2 T's, not one) and I am of the opinion that 1 gallons are okay as long as they are kept clean. 2 changes a week is suffice, one 50% water change and one 100% change (also cleaning the decorations). Always add conditioner to tap water when putting the fish back in. In such small bowls you DO NOT need filters, it causes more problems in tanks smaller than 5g anyway. Bettas are tropical fish and thus need heaters to maintain a temperature of 78-82F. In the summer just placing their tanks in a warm room can be enough but you should really invest in heaters. They're cheap these days for a 10w heater. Freeze dried worms lack any nutrition and often can cause bloat. If you want to still feed them, soak them in water before feeding to avoid the bloat. But even better is to go buy frozen bloodworms at the pet store. Or daphnia. Bettas LOVE them! Mine will do anything for frozen bloodworms. Be careful not to overfeed! Have a good pellet for daily feeding (5 days a week), feed frozen bloodworms once a week and fast them for the 7th day. Keep in mind they will eat forever but they should only be fed 3-4 pellets and a couple worms in a meal. It could be Sheldon has parasites. Check the color of his poop. If it's reddish and in a little ball or clump at the bottom then he's fine. White stringy poop indicates parasites. Maybe his water is too cold, try placing him in a warmer spot until you get a heater. Maybe his water is dirty. Try doing a 100% water change and see if there is any improvement in his behavior. If you look down on him from above, do his scales appear to stick out? Like a pine cone?? DO you have many decorations or gravel in the bowls? Those take away swimming room and thus increases the chances of ammonia taking over the quality of the water. I would love to see pics. Thanks for replying Sorry about my typo. And my room is really warm, almost too warm, so I'm investing in a heater once it cools down. And I checked Sheldon, he seems fine except one thing I noticed: his gills go out way further then Bently's when he breathes, a little unnatural looking. His scales are fine, though. He's starting darting around his bowl, but not in a healthy way, like he's paranoid or something. Sorry I can't upload some pics. What is the temperature in the bowl? Some disagree but my opinion has always been that 1 gallon is way too small for a betta. Can they live in a small bowl like that? Yes. But they're MUCH more prone to illness, shortened lifespans, etc. and tend to be less active and colorful. When you're able to, consider upgrading them to small aquariums, even a 3-gallon would be a huge improvement . Anyway, for now, I'd be interested in your water parameters. Bring a water sample (not right after you change the water, right before would be better) to your local pet store (one that sells fish) and ask them to test it. Ask about your ammonia, nitrite, nitrate, and pH. Alternatively, buy a cheap test kit and test your water at home. Edit: What hiding places do the fish have? If they don't have anywhere to hide they're going to feel pretty stressed. That could explain Sheldon's reluctance to eat. "I don't understand, because Bently manages his gallon bowl just fine." You've only had the fish for a few months so this actually isn't true. You don't know that yet . Bettas should live a few years, a few months isn't enough time for many issues develop. Make sure you keep an eye on him. True, 1 gallon is on the small side but manageable. It seems to scare new hobbyists when we tell them to upgrade right away. Sasami is correct about the illness thing but it is a fine home for now. I upgraded my first betta after 4-5 months of living in a .5 and 1g. Caves are important. Dollar stores carry small terracotta flower pots, untreated. The hole in the bottom is too small for bettas to get stuck, you could get one for your fish each. If he's darting around it might be he sees his reflection on the side of the glass. As for the gill, can you post a pic? Some badly bred bettas from the store are going to have some differences. My CoT has larger gills than my VT, for instance but it hasn't been a health issue. The hole needs to be filled in, actually. I'd recommend aquarium sealant or something similar. Ah, I see, I just wanted to clarify as the common ones have bigger holes . 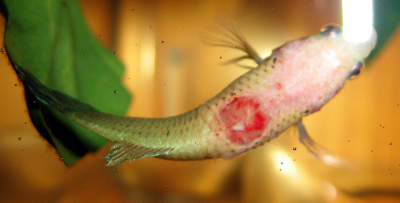 A lot of people have ended up with injured fish because they didn't think they could fit. np I haven't seen traditional pots in a while but I guess evrywhere is different. Hows the betta now anyway, unicornlover?